The following is our review of Key Nutrients Key Keto. It is a dietary supplement that claims to help you burn fat while increasing your energy and focus. 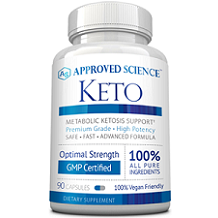 The manufacturer believes that this product is the best-tasting, most effective, and best priced ketone product on the market. The ingredients in this product have been shown to benefit athletic performance, mental performance, and increased energy. This product can help make weight loss a lot easier when combined with a ketogenic diet and an exercise plan. Continue reading for our full review. The ketogenic blend contains calcium beta-hydroxybutyrate, sodium beta-hydroxybutyrate, and magnesium beta-hydroxybutyrate. These ingredients are meant to help you reach ketosis quicker without getting the keto flu. They can also provide you with lasting energy at any time of the day without jitters, heart pounding, or nausea. It is recommended to add 1 scoop to 14 fluid ounces of room temperature water and mix well. First time users should start out with a half of a scoop per day and gradually increase to a full serving 1-3 times a day. Do not exceed the suggested serving size. You should consult a healthcare professional before use if you are pregnant, nursing, have a serious medical condition, or are under age 18. Anecdotal responses of dizziness, headaches, and stomach discomfort after consumption have been reported. Exogenous ketones are generally not tasty and not meant to taste like a sugary fruit smoothie. Some will find it to be bitter or have less than pleasant aftertaste, which is why they recommend 1st timers to try half a scoop. 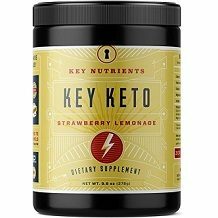 Key Nutrients Key Keto costs $49.94 for a 9.8 ounce container. The packaging says there are 20 servings per container. This product will last you almost a month if you start out taking half a scoop. This product is definitely on the expensive side. The manufacturer offers a 60-day 100% guarantee. They say you have 60 days to return an item if you are not fully satisfied. They also say that they cannot accept returns if you simply just changed your mind about a product so buy carefully. There were no other details given about the return policy. There are a couple of positive things about Key Nutrients Key Keto. This product contains no sugar, protein, fat, cholesterol, caffeine, gluten, dairy, animal product, or derivatives. It also is given a strawberry lemonade flavor in order to make it taste better and give the consumer a better experience. There were a couple of negatives as well. This product is pretty expensive, especially since it may not even last you a month. The guarantee for this product also lacks a lot of details leaving us to believe that it isn’t that strong of a policy. There were also some mild side effects reported from using this product. We feel you can find a more affordable and effective product elsewhere.